There was a time when Tom Stephenson thought professional rugby was pretty easy. Having enjoyed a rapid rise through the Saints ranks, the centre went on to play a part in the historic double-winning season of 2013/14 and the table-topping campaign a year later. Everything was going smoothly for the Academy graduate, who had shown plenty of flashes of brilliance as he continued to establish himself at Franklin’s Gardens. But after the highs came the lows. And after two serious injuries, he was not only battling for a regular place in the first-team, but for any sort of game time at the top level at all. Stephenson suffered a foot injury in a Champions Cup game at Racing 92 in December 2015 and did not return until the following pre-season. Then, just as he had got himself in good shape for the new campaign, he broke his leg in a friendly against Rotherham Titans at Franklin’s Gardens. It ruled him out of the entire 2016/17 season, with Stephenson unable to play for Saints again until earlier in this campaign, coming off the bench at Clermont in October. He did go on to get 10 starts in the black, green gold but after a turbulent time, he has now opted to move to London Irish, who will be in the Championship, for next season. It has not been a decision he has taken lightly, especially as he has always been a Saints fan. But Stephenson is desperate for a fresh start as he bids to become the kind of player he feels he can be and realise the potential he has always had. “Saints did offer me a contract but Irish offered me more oppotunity to play and that’s what I felt I needed,” the 24-year-old explained. “I need to play week in, week out. “To be honest, I’ve had a lot of good times at Saints but I feel like the last couple of years have put a bit of a downer on it and I need to get away and start afresh. “The last couple of years have been hard at Saints and mentally I needed a fresh start more than anything. “I knew when I signed at Irish that they would probably be relegated and from a personal point of view, I felt playing in the Champ for a year would do me good, just to have that week in, week out rugby, less pressure than the Premiership. “I feel I can really get my game where I want it to be and then maybe come back up to the Premiership a year after and start again. “From a personal point of view, I felt Irish was going to be a lot better for me. Stephenson’s final act in the black, green and gold was to skipper the Wanderers to a second successive Prem Rugby A League title. But he, like so many members of that squad, has become stuck between the first team and the second team this season with seemingly no chance of really becoming a Saints regular. The likes of Ben Nutley and Jamie Elliott will also be leaving Northampton this summer. And Stephenson said: “It’s good that they’re going elsewhere but I feel like a lot of them could have been given more opportunity. “It’s one man’s opinion that will determine whether you’re going to play and at Saints I feel like if you’ve got Academy attached to you, you’re more droppable than someone else who hasn’t got that Academy attachment. “For boys who have come up through the Academy, like TC (Tom Collins) and Luds (Lewis Ludlam), there seems to be a lot more pressure on you to perform every week than someone else. Though the past three seasons have not gone to plan for Stephenson, he has still managed to pack plenty of fond memories into his kit bag thanks to what went before. “The Prem final, for obvious reasons, was a highlight,” said Stephenson, referring to the dramatic extra-time success against Saracens at Twickenham in May 2014. “That will stick with me for ever. “The Gloucester game (in March 2014), when I scored that try, I’ll never forget that feeling of throwing the ball in the air, in front of our home fans at Franklin’s Gardens. That was the most special feeling I’ve had. “We had the mentality that we could just turn up and win. We were that confident in ourselves and we had an unbelievable team as well. 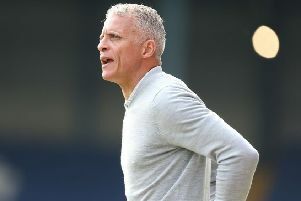 “The sad thing about the past couple of years is that when I was younger, we turned up and we knew we were going to win so that gave the coaches freedom to play the younger players, but in the past couple of years there has been more pressure so those younger boys haven’t got the opportunity they deserve. “I was quite lucky that I came through when I did. “In the Premiership season, I played about 22 games and then the same the season when we finished top. Such success is something Stephenson never envisaged when he moved to Saints from Wasps as a youngster. “I was playing for England Under-16s and Dusty Hare was there and he said to my mum that Saints kind of liked the look of me,” explained the Oxford-born player. “He knew I was at Wasps, but he said that if I ever fancied Saints, they’d be more than happy to have me. “I was a Saints fan from five to 15/16 so when I heard they wanted me, I was interested. “Wasps were telling me I’d have to move to London and take my schooling there because they offered me a full-time deal at 16, but I wasn’t keen to do that. “Saints said I could come here and be home basically, but the main reason was because I supported Saints. “I went into the EPG, played in the Academy for two years and then got offered a full-time contract. “I didn’t really know how good I was or if I could make it. I had no idea where I was on the scale and then they offered me a contract, and I was like ‘oh, wow, I actually might be able to do this’. It was a relief more than anything. “I didn’t really feel the pressure. I captained England Under-18s, but I thought a lot of it was right place, right time. “I didn’t hear much hype, I obviously read some stuff, but I thought every player had that. “I didn’t really believe I could make it until I went full-time in the Academy. “From there, I had two years where we won the final and then finished top of the league and everything was pretty easy at those stages. “I came into it thinking professional rugby is pretty easy because we seemed to win every game. On the injuries that blighted his progress, he said: “They were pretty hard. “The first one, against Racing, I was like ‘fair enough, everyone gets injuries’, because I never really had an injury before that - never a serious one anyway. “I never had an operation or anything. “But to come back and the game I came back I broke my leg, that was pretty hard to take because I worked so hard to get back fit and get myself in good shape. “I felt like I was ready to take on that season and to break my leg first game was pretty hard to take mentally more than anything. “Knowing you’ve put all that effort in for nothing is tough, especially when you know you’re going to have to do it all again but for a longer time. “I definitely went through some bad stages with that injury. “It was really hard, but I set myself short goals to get in shape and improve as much as possible. “I was a bit naive thinking I would come back from a triple leg break and be just as powerful as I was straight away. “I didn’t realise it was going to take me at least six months to really get my power and pace back. Luckily, I finally have now. My times are quicker than before and I’m relieved in that sense. “It frustrated me that I wasn’t able to run the same way and get the same speed off the floor. As Stephenson says, he now appears to be getting back to the levels that he wants to be at. And next season, he will look to hit the ground running in a London Irish side that will also contain Stephen Myler and Danny Hobbs-Awoyemi. “I have spent all of my career at Saints but there’s still a lot of it left,” he said. “The next part is at Irish, but I’ve loved every minute at Saints and you couldn’t find a much better group of lads. “They definitely deserve to have some good times again like we had in my early years there.